As consumers have become more interested and informed about the foods they choose, certain buzzwords have been appearing so often in food marketing and on restaurant menus that they’ve become standard among the food industry. Since these terms have no precise definition or regulation, they can be confusing to consumers. To help food brands adhere to the true meaning behind these concepts and clear up any misconceptions, QSRMagazine.com compiled the following list of the five most frequently used buzzwords in the foodservice industry today. 1. “Fresh” Causes a Frenzy – This much-used buzzword describes high-quality foods that are made to order and not modified by processing. Consumers often associate healthy eating with choosing fresher, less-processed ingredients. 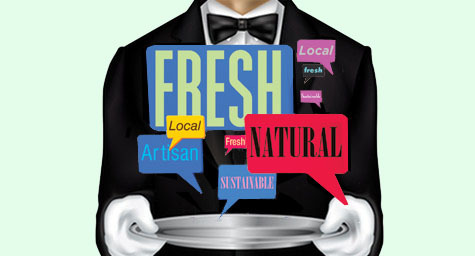 Still, it’s a complex concept because “fresh” can apply to a variety of elements, from the way the food is made, to the people who made it, and how it’s packaged. It’s one of the main menu buzzwords today and basically implies that ingredients are of a higher quality. Some food brands like Subway emphasize freshness and have built their reputations on it. This leading chain is known for baking fresh bread throughout the day, using the freshest vegetables and making meals to the customer’s specifications right before their eyes. Subway has helped alter the misconception that fast food can’t be fresh food. Other brands stretch the term by saying that foods are made fresh on a daily basis, but that only refers to the preparation and not the quality of the ingredients. This can be very misleading to consumers. Fortunately, consumers are becoming much savvier about their food choices and this is causing more and more food brands to make freshness a priority. 2. “Local” is Loved by All – This trendy term refers to food grown or raised in a particular area or neighborhood that’s less than 400 miles away from the quick-serve location where it’s being served. While there’s no official definition for “local,” the 400-mile range is the general rule used by the USDA, but many food brands strive for a closer radius. The main argument for local foods is that products raised or grown near the locations where they are consumed usually arrive fresher and ultimately taste better. Another factor is that they support local communities, which has become important to many consumers looking to support local businesses. Some brands like Subway think the term is too vague and try to avoid any references to the exact location of sourcing. Still, the chain encourages franchisees to incorporate locally sourced products any time possible, as long as they meet the brand’s standards and are cost-effective. In the minds of consumers, “local” evokes a sense of community support and produces an emotional connection to the people and places producing the products. 3. “Natural” is Naturally Popular – This is one of the most confusing buzzwords due to a wide range of definitions. Generally, “natural” refers to foods that are produced by or existing in nature and are free of manmade, artificial ingredients like antibiotics and added hormones in animals. Since this is a vague term, it’s important for consumers to do a little research to uncover what the food brand really means in its use. Some brands like Chipotle use the term to refer to their insistence on naturally raised meat that comes from animals raised humanely and without antibiotics or added hormones. The Charley’s chain uses the concept to imply their use of high-quality, real ingredients, without artificial additives, that highlight the true flavor of the food. 4. “Artisan” is a Hit – This is a buzzword that refers to high-quality foods that are often produced in small batches and specially crafted using traditional methods and processes. The National Restaurant Association (NRA) believes that the term indicates a time-honored recipe or process, while other industry experts say it denotes a food’s heritage or story. Consumers often view artisan foods as more authentic and made by real people in limited quantities using specialized ingredients. Artisan processes are believed to reflect a personal passion, a special skill, or a revered tradition. These foods also imply the use of higher-quality ingredients. 5. “Sustainable” Gains Support – This one is difficult to define, but is generally understood as food from systems that strive to avoid depletion and damage to their source or the environment. The term is used by the food industry as a way to appeal to the consumer’s desire for environmental responsibility. Fortunately, food brands are starting to correct the misconception that sustainable practices are impractical, costly, and only valued by a small market. At Subway, sustainability is defined as being environmentally responsible, socially conscious, and economically viable. The brand also believes it refers to conducting business with greater efficiencies to support the generations of tomorrow. Just as sustainability has grown in importance among consumers concerned with the environment, it’s also been gaining acceptance by food brands that are realizing it can increase overall profitability while preserving our natural resources and enhancing the customer’s brand experience. To leverage the power of creative marketing for your food brand, contact MDG Advertising today at 561-338-7797 or visit mdgadvertising.com. MDG Advertising is a full service advertising agency and one of Florida’s top creative ad agencies. With offices in Boca Raton, FL and New York, NY, MDG specializes in developing integrated 360° marketing strategies that give clients a competitive advantage. Our core capabilities include branding, logo design, digital marketing, print advertising, mobile marketing, email marketing, media planning and buying, TV and radio, video ads, Web design and development, content marketing, social media marketing, and search engine optimization (SEO). To stay on top of the latest trends in food marketing and advertising, contact MDG Advertising today at 561-338-7797 or visit mdgadvertising.com.